Therefore, soramame beans for lunch. "Soramame" is broad bean. After the festival of draconic westeria at the Shiratori shinto shrine, I stopped at the roadside station 'Michi-no-eki' at the very front of the Tohoku Expressway Murata IC. This place is full of many people, too. For lunch, I entered in the dining room at the roadside station. In fact, I visit to this dining room for the first time. And does everybody know? 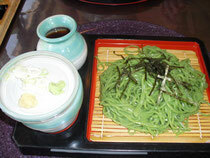 Murata-machi, Miyagi is a production center of broad bean, Soramame. And what found here is "soramame udon." At first I ordered a basic cold soramame udon. Hmm, flavor of soramame.... The noodles are considerably chewy though less than Korean cold noodles. Appreciate it once by all means !